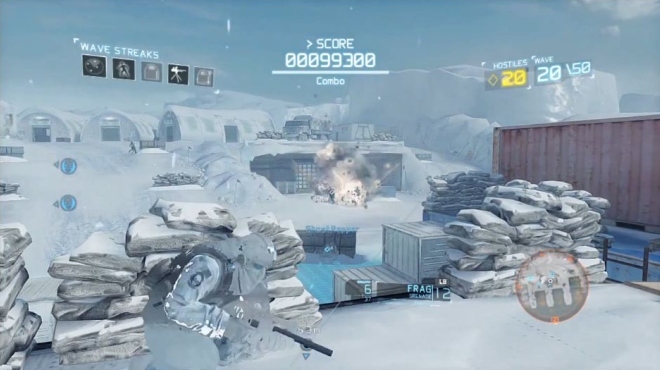 Ubisoft and Red Storm Entertainment have released the launch trailer for the first Ghost Recon Future Soldier map pack, Arctic Strike. The DLC is live on Xbox 360 today, tomorrow for PS3 users. Acrtic Strike will run you 800 Microsoft point, or $9.99/£7.99 on the PSN Store. Also, Ubisoft detailed the new weapons and achievements/trophies on the official blog. (Ghost) F2000: 5.56x45mm Assault Rifle. Unlike many bullpup rifles, the F2000 features ambidextrous controls and a unique casing ejection system. Its compact design makes it highly maneuverable. It also features a high rate of fire, but recoil is easily controllable. (Bodark) S805: 5.56x45mm Assault Rifle. The S805 is a highly customizable gas operated modular rifle. Since the rifle is chambered in 5.56x45mm, recoil is very manageable when compared to other Bodark weapons. (Bodark) Type 05: 9x19mm Submachine Gun. The Type 05 is a unique bullpup SMG with an integrated foregrip, which improves the weapon’s stability while on the move. The threaded barrel allows for the easy addition of a suppressor. (Ghost) MP9: 9x19mm Submachine Gun. The MP9 is an extremely lightweight SMG. It features an integrated foregrip which helps improve the weapon’s stability while on the move. The unique appearance of the muzzle allows for the easy addition of a suppressor. (Bodark) OCP-11: 5.45x39mm Personal Defense Rifle. The OCP-11 or ‘Popov’ combines the durability and simplicity of Russian firearms design with the modularity of Western weapons. The small round and large ammunition capacity allows for a high volume of controlled fire with relatively light recoil. (Ghost) Mk17 PDW: 7.62x51mm Personal Defense Rifle. The Mk17 PDW is a highly customizable, short-barreled version of the SCAR-H. The more powerful 7.62x51mm ammunition hits targets harder, but increases felt recoil and results in a smaller magazine size.